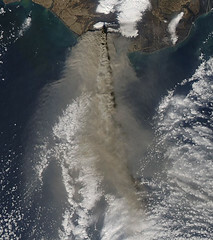 The MODIS instrument on NASA's Aqua satellite captured an Ash plume from Eyjafjallajokull Volcano over the North Atlantic at 13:20 UTC (9:20 a.m. EDT) on April 17, 2010. The Eyjafjallajokull volcano in Iceland erupted Wednesday, April 14, for the second time this month. The volcano is still spewing ash into the air and the ash clouds are impacting air travel in Northern Europe.